Output growth, measured using Gross Value Added at basic prices, is likely to improve marginally in 2015-16 and further in 2016-17. Quarterly growth projections for the next five quarters indicate that growth is likely to improve. 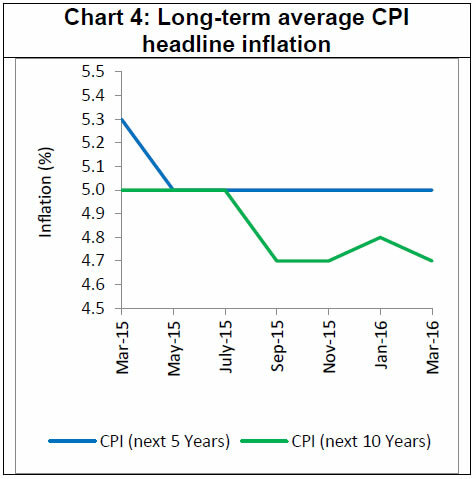 CPI headline inflation is likely to remain in the range of 5.3 per cent to 5.5 per cent during FY: 2016-17. Medium term growth declined marginally and inflation expectations remained unchanged from the levels indicated in the last round of the survey. The Reserve Bank has been conducting the Survey of Professional Forecasters since September 2007. The results of the survey represent the views of the respondent forecasters and in no way reflect the views or forecasts of the Reserve Bank of India. Twenty Six professional forecasters participated in the latest survey round (Round 39) conducted in March 2016. The results of the survey are presented in the Annex in a tabular form. Forecasters expect real Gross Value Added at basic price (GVA) to increase by 7.3 per cent in 2015-16. ‘Agriculture & Allied Activities’ and ‘Services’ are expected to grow by 1.1 per cent and 9.0 per cent, respectively. ‘Industry’ growth forecast has been placed at 7.5 per cent (Table 1). In 2016-17, GVA is expected to increase by 7.7 per cent, led by growth in ‘Services’ by 9.1 per cent. ‘Agriculture & Allied Activities’ and ‘Industry’ are expected to grow by 2.6 per cent and 7.4 per cent, respectively. 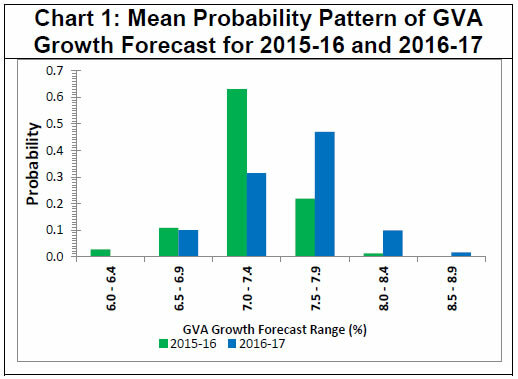 In terms of subjective probabilities assigned to growth projections, forecasters ascribed maximum 63 per cent chance (based on the average of individual forecasts) that GVA growth in 2015-16 will be in the range of 7.0-7.4 per cent (Chart 1). For the year 2016-17, GVA growth in 7.0-7.9 per cent range is the most probable outcome. Note: 1. Growth rates are in per cent. 2. Figures in parentheses are change in forecasts from the previous survey round. Private final consumption expenditure at current prices is expected to increase by 10.8 per cent in 2015-16 and further by 11.8 per cent in 2016-17 (Table 2). Gross Saving Rate is projected at around 30.7 per cent of Gross National Disposable Income (GNDI) in 2015-16 and 30.8 in 2016-17 (Table 2). Forecasters expect Gross Fixed Capital Formation Rate at 29.4 per cent of GDP in 2015-16, which is expected to improve to 30.0 per cent of GDP in 2016-17 (Table 2). Money supply (M3) is expected to increase by 11.6 per cent in 2015-16 and further by 12.7 per cent in 2016-17. Bank credit is expected to expand by 11.4 per cent in 2015-16 and further by 12.3 per cent in 2016-17 (Table 3). Central Government’s gross fiscal deficit (GFD) is projected at 3.9 per cent of GDP in 2015-16 and is expected to moderate to 3.5 per cent of GDP in 2016-17. The combined GFD of Central and State Governments is projected at 6.5 per cent of GDP in 2015-16 and is expected to improve to 6.2 per cent of GDP in 2016-17 (Table 4). Merchandise Exports is likely to decline by 16.2 per cent in 2015-16 which constitutes a downward revision by 80 basis points (bps) from -15.4 per cent in the previous round. Growth of merchandise exports is expected to improve to 1.7 per cent in 2016-17 (Table 5). Current Account Deficit is projected at 1.0 per cent and 1.3 per cent (of GDP) in 2015-16 and 2016-17, respectively. Capital Account is expected at 2.2 per cent of GDP in 2015-16 (Table 5). Real GVA growth at basic prices is expected to improve gradually from 7.3 per cent in Q4: 2015-16 to 7.7 per cent in Q3:2016-17 (Table 6). CPI (Combined) headline inflation is expected at 5.4 per cent in Q1:2016-17 and to remain above 5.0 per cent till Q4:2016-17 (Table 7). The core CPI (defined as excluding food and fuel) inflation is expected at above 5.0 per cent from Q3:2016-17 (Table 7). WPI inflation is expected to turn positive from Q1:2016-17 and is expected to increase to 3.3 per cent in Q4:2016-17 (Table 7). 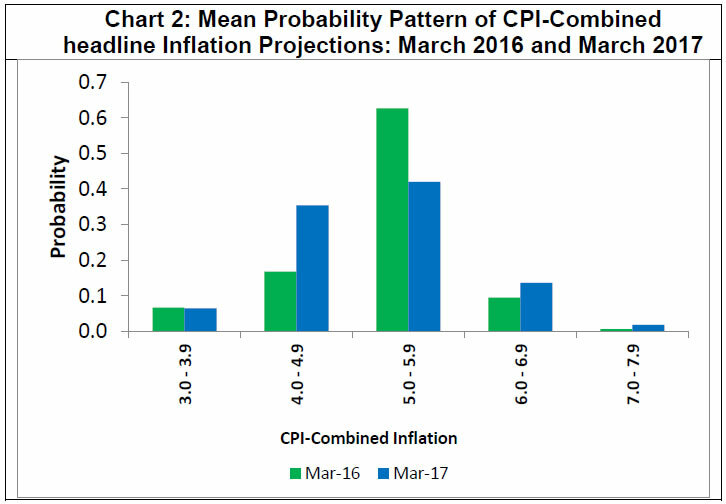 Forecasters assigned maximum probability of 63 per cent that CPI headline inflation will be in the range 5.0-5.9 per cent in March 2016 (Chart 2). Based on this probability distribution, the implicit CPI inflation rate for March 2016 is expected at 5.1 per cent. For March 2017, the forecasters assigned maximum probability of 42 per cent that CPI inflation will be in the range of 5.0-5.9 per cent and 35 per cent in the range of 4.0-4.9 per cent. Variation observed in the forecast of the Indian Rupee against the US$ suggest Rupee to be volatile in the short-term. In terms of median of forecast, Indian Rupee is expected to move in the range of ₹ 67.6 to ₹ 68.9 per US$ during FY: 2016-17 (Annex Table A.3). 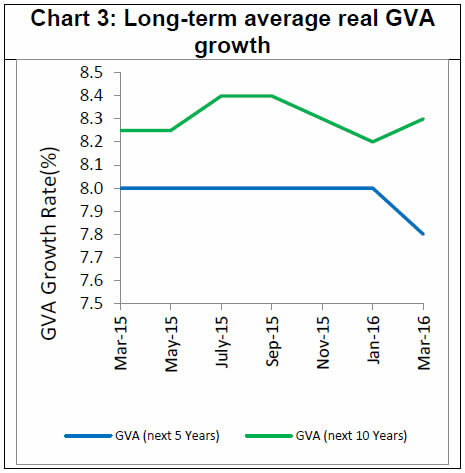 The long- term real GVA growth expectations increased by 10 bps to 8.3 per cent in the current round from 8.2 per cent in the previous round. The medium- term growth forecast for the next five years moderated to 7.8 per cent over 8.0 per cent in previous round (Chart 3). The average CPI inflation for the next five years remained unchanged at 5.0 per cent, in the current round from the previous round, while the long-term ten years inflation forecast declined to 4.7 per cent from 4.8 per cent. (Chart 4). 1 Data for the previous survey round were released on February 5, 2016 on the RBI website.